Coffee, Espresso, Cappuccino, and Latte: What are the Differences? Your daily stop at the coffee shop on the way to work presents you with a myriad of choices. The menu board screams for your attention as you try to sort out just what you want. You can choose coffee, espresso, cappuccino or your favorite latte. But more often than not, you find yourself wondering what the differences are between them. The retail coffee industry has become unnecessarily complicated due to a lack of information about the different kinds of coffee drinks. In an effort to make it as simple as possible, here’s a brief rundown. Our explanations are intended only to be a generic guide; we may differ from other companies in the coffee industry in terms of the details. The term ‘coffee’ is generally a generic term that covers any hot beverage made with roasted coffee beans. However, the term is a bit more specific here in America. Our ‘American coffee’ tends to be a beverage created with Arabica coffee and extremely hot water. Roasted coffee is placed in some sort of basket over which hot water is poured for the purposes of extracting the oil in the roasted beans. Coffee can also be cold brewed or made with a French press. Americans tend to drink this standard form of coffee with cream and sweetener added. Espresso drinks can be made with the same roasted coffee products American coffee is made with. The primary difference is the concentration. To make espresso properly, ground coffee must be compacted tightly into its receptacle before hot water is forced through. This brewing method increases the strength and flavor significantly. As a result, a good espresso tends to be made with higher quality coffee beans. The flavor of inferior coffee is hard to hide in an espresso drink. Cappuccino is a beverage that is made with a combination of espresso and milk. Milk is steamed in order to create a frothy liquid with about twice the volume of regular milk. This creates the foam cappuccino beverages are known for. Also important to note is that cappuccino begins with equal portions of espresso and milk. This preserves the flavor of the coffee to a greater degree than a standard latte. Latte is also a beverage made with espresso and milk. Its unique characteristic is that it starts with twice as much milk. The milk is heated but not frothed, so latte drinks don’t tend to be as foamy. Both milk and espresso are combined simultaneously in a serving cup to create a rich and creamy beverage. Any excess foam resulting from heating the milk may be poured over the top of the latte for artistic effect. Now you know the differences between coffee, espresso, cappuccino and latte. If you are interested in coffee and beverage service for your office, please feel free to contact Galaxie Coffee. We provide a full range of coffee and tea products along with fruit juices and other beverages. Young adults have always influenced coffee consumption in America. But as time marches on, younger consumers (particularly millennials right now) are having a greater influence than ever before. What makes them tick are the kinds of things that product and equipment manufacturers are focusing on for one simple reason: millennials are more likely to spend more money on coffee consumption than their older counterparts. So, just what are the coffee consumption habits of the millennial generation? Keep reading to find out. Suffice it to say that millennials are very particular about their coffee. 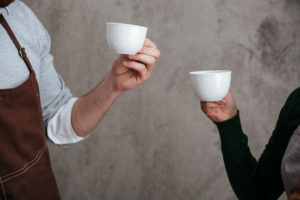 Where older coffee drinkers are content with traditional, American coffee made with drip brewers, millennials are more open to all sorts of espresso-based beverages. According to the National Coffee Association’s 67th National Coffee Drinking Trends report, consumption of espresso products has nearly tripled in the last seven years. Much of that increase is due to the expanding preferences of millennials. Alongside a stronger preference for espresso, millennials are also more likely to choose gourmet specialty coffees. Consumption of gourmet coffees has tripled among millennials since 2008; it has doubled among those ages 25 to 39 as well. Simply put, gourmet coffees and espressos are all the rage among millennials. Millennials are sticklers for what they consider quality. Whether it’s smartphones or clothing choices, they are willing to pay top dollar for quality they appreciate. The same holds true for their coffee choices. Data suggests that millennials will drink less coffee compared to their older counterparts, yet focus more on quality when they do consume coffee beverages. One could argue that the most profound affect millennials are having on the coffee industry relates directly to their willingness to try different things. For example, it is the younger coffee drinker that is responsible for the astronomical success of single cup brewers. Despite being exponentially more expensive, millennials are willing to pay for the convenience of single cup. Their willingness to try something different has led to the recent cold brew craze. It is the driving factor behind new age coffee houses, fair trade coffee products, and nearly every other innovation that has come to the coffee industry in the last ten years. The team at Galaxie Coffee is acutely aware that the coffee industry is evolving over time. This is nothing new. Evolution has always been part of what we do. Therefore, we strive to meet every need presented by our customers. That will not change even as millennials influence how coffee is consumed in the United States. For more information about our business, please contact us at any time. Galaxie Coffee is proud to serve the entire greater New York area by providing the best coffee and beverage service along with breakroom and janitorial supplies. We would be honored to service your office with high-quality coffees, teas and other beverages.